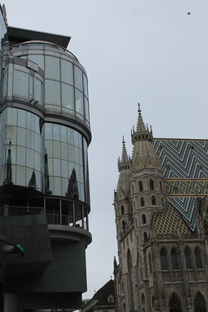 An architectural scandal of huge proportions broke out in Vienna in the mid-80s when Hans Hollein planned to build a modern glass building right across from St. Stephen’s Cathedral. The Haas-Haus was built and opened in 1990, drawing the world’s attention to contemporary architecture in Vienna. 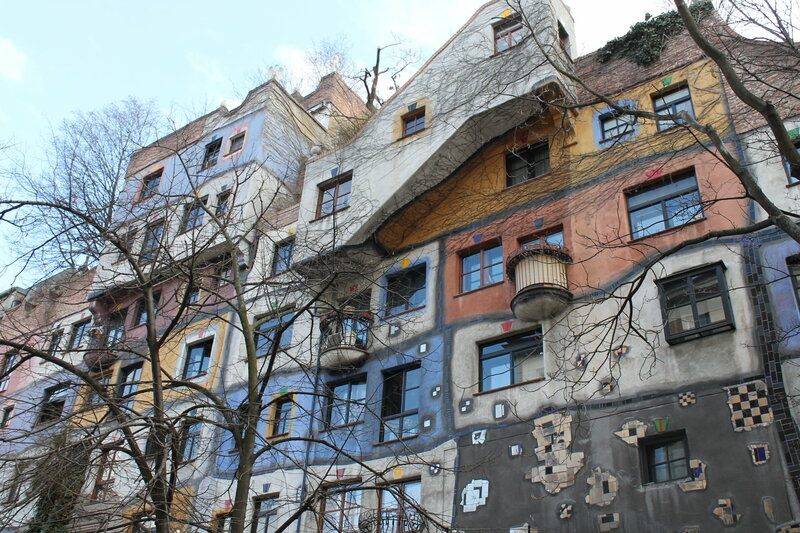 One of the most famous buildings of the '80s is the Hundertwasserhaus, Vienna’s most unusual public housing development. The same architect also designed Vienna’s Kunst Haus Wien and Spittelau incinerator. The key to all Hundertwasser’s projects is creative freedom for architecture and harmony with nature. His colourful projects have become very popular with both the Viennese and the tourists. The skyline of the Austrian capital now features a building by Massimiliano Fuksas inspired by the cross-contamination of art and architecture, a construction that looks almost like Land Art. The 37 and 34 storey towers are two lightweight giants, 138 and 127 metres tall, standing in two vast walls of clear glass, the edges of which are impossible to distinguish. The towers are neither parallel nor perpendicular, but placed diagonally in relation to one another and connected by a series of bridges irregularly positioned at different heights. An extraordinary example of industrial reclamation on a vast scale, involving Europe’s biggest gasworks. The project aimed to convert four gasometers into homes with adjacent services and redevelop the entire neighbourhood. Jean Nouvel’s conversion of Gasometer A did not completely change on the exterior, but fitted living spaces inside the towers, resting against their inside walls. The glass roof and use of glass and steel create a lightweight structure. 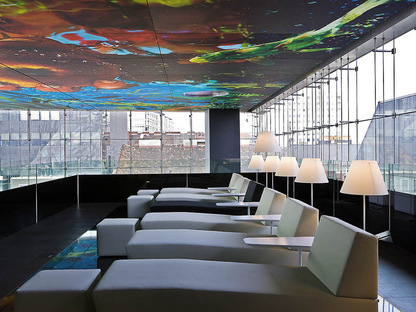 Not just a hotel, Jean Nouvel’s project is a true work of art created in collaboration with other prominent personalities in the world of architecture such as Pipilotti Rist and Patrick Blanc. Hotel Stephansdom is a complex building made of glass and steel in which every façade is different and colours range from black to white. Patrick Blank created a vertical garden with 20,000 different plant species, while Pipilotti Rist designed ceilings lit up with spectacular video projections. A new centre of aggregation in the city of Vienna was opened in 2001, followed by a project by architectural studio Ortner & Ortner involving construction of two new museums in opposed twin spaces behind the existing historic museums. An immense white concrete cube contrasts with the former Imperial Stables. The new building, covered with white shell-limestone, has 5,400 square metres of display space on four levels. The gigantic cube, 24 metres high, is a monolith of classic elegance; its big windows bring light into the building, particularly the 19-metre-high foyer with its glass roof, one of the world’s most modern museum interiors. The panoramic window on the fourth floor offers beautiful views over the Imperial Palace and the rooftops of central Vienna. The museum houses works by Schiele and the equally visionary Gustav Klimt. Only minutes away from the Leopold Museum, Mumok hosts a permanent collection including works representing the principal movements in twentieth-century art, from Modernism to Pop Art and Fluxus. The museum houses art by Pablo Picasso, Andy Warhol, Paul Klee, Piet Mondrian, Robert Rauschenberg and Jasper Johns. On the outside, the building looks like a giant parallelepiped covered with grey basalt, with a slightly curved roof, while the interior contains 4,800 square metres of exhibition space on five levels. The trait d’union between the two structures is a big plaza with cafés and restaurants, a place for people to stop, talk, read and relax. Zaha Hadid built the central corpus of the campus, including a library with park views and an Aula Magna. The asymmetrical building occupies more than 41,000 square metres and contains a language laboratory, seminar rooms, administrative offices, event rooms, a student centre, a bookshop and a cafeteria. The construction, on five levels above ground, is composed of two main volumes which overlap and fit together, the taller of which has a projecting roof with a glass front over Prater Park. The square, linear design of the façades contrasts with the fluid interior dominated by the big entrance hall, the Forum, conceived as a central plaza, while the top two levels, with views over the park, contain the library. In 2013 Dominique Perrault completed Austria’s tallest building, DC Tower, characterised by a “wavy” façade and a slender structure. The waves of the façade give it a liquid, intangible, malleable look that changes continually with the light conditions. On the inside, however, Dominique Perrault gives the building strong physical presence and a material look; the structure is left in view, with its reinforced concrete frame. In the entrance halls and corridors stone and metal help to create the impression of a solid, reassuring structure.